If you are looking for a rug that is both stylish, comfortable and beautiful to look at as well as being perfect for high traffic area, then you have found it with the Florence collection. Available in a wide range of sizes, designs and colours, these rugs will fit effortlessly into your home and work with your decor to highlight your modern and stylish interior. Contrast a monochrome or minimalist room with a rug from our Florence collection, such as the Lorenzo Blue or the Coffee Shop Silver and create an eye-catching space for next to nothing. 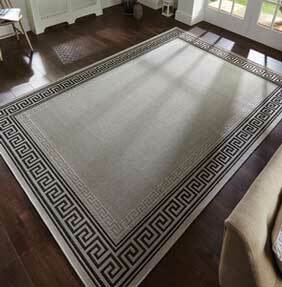 Not only are the products in our cheap rugs collection excellent quality, they are also excellent value. This range is made from 100% polypropylene, each rug features a flat woven pile.